Caja Laboral Vitoria remained undefeated in Group F by edging Maccabi Electra Tel Aviv 70-71 on the road at Nokia Arena on Thursday. Vitoria improved to 2-0 in Group F and grabbed its fifth consecutive win, while Maccabi dropped to 0-2. 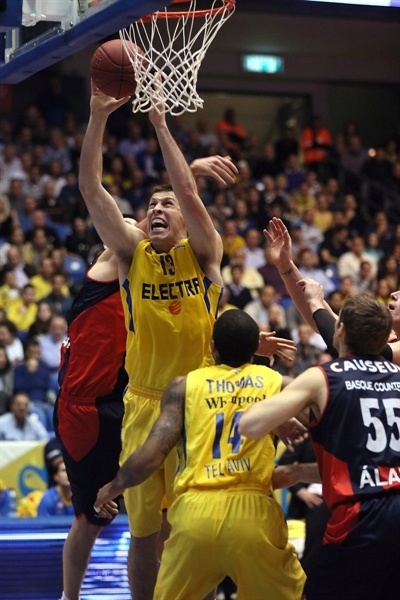 Nemanja Bjelica paced the winners with 17 points. Brad Oleson added 10 and Tibor Pleiss pulled down 11 rebounds, but it was Fernando San Emeterio who stood out as was the man of the night with the game-winning shot down the stretch. 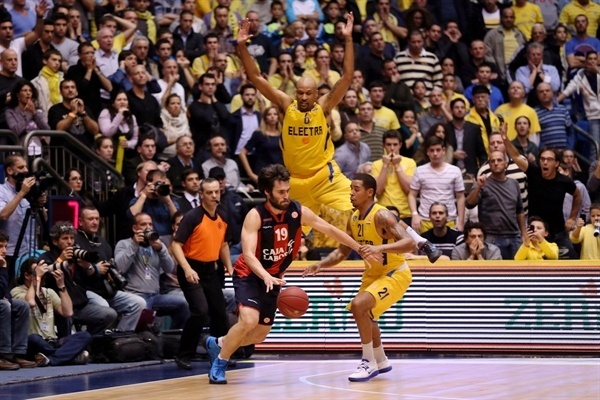 Ricky Hickman led Maccabi with 18 points. Darko Planinic added 11, Devin Smith and Sylven Landesberg each had 10 and Shawn James got 10 rebounds and 3 blocks despite being troubled by a shoulder injury. A 7-0 run that Landesberg capped with an acrobatic buzzer-beating jumper gave Maccabi a 23-20 lead after 10 minutes. 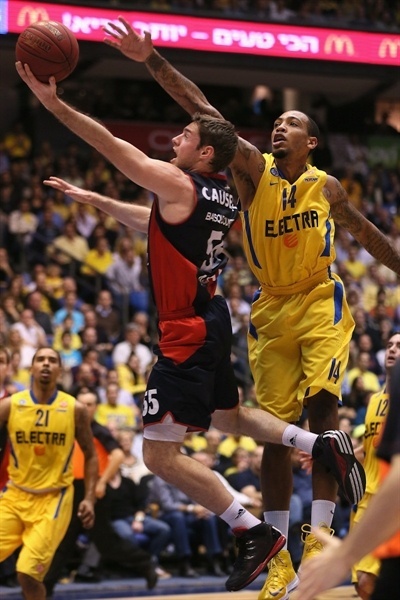 Andres Nocioni and Nemanja Bjelica fueled a 2-13 run which led Vitoria to a 29-36 margin. Three-pointers by Omar Cook and Fabien Causeur boosted the guests' margin to 32-44 at halftime. Vitoria still led 39-49 midway through the third quarter but a 19-1 run that Smith capped with a layup gave Maccabi a 58-50 edge early in the fourth quarter. Nemanja Bjelica, Oleson and Lampe combined for 6 fourth-quarter three-pointers, but Oyahon gave Maccabi a 70-69 edge with 29.6 seconds to go. 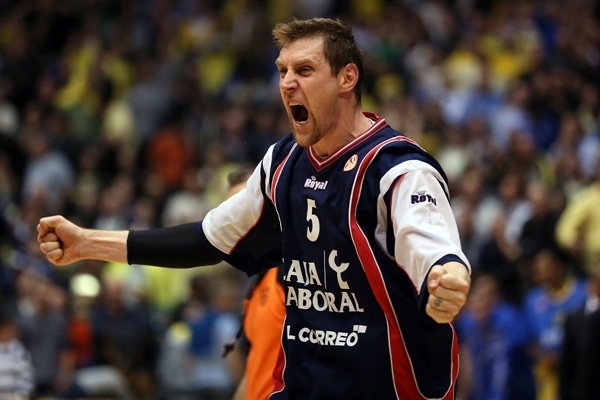 Vitoria looked for its usual go-to guy and San Emeterio delivered with the go-ahead basket with 8.9 seconds left. 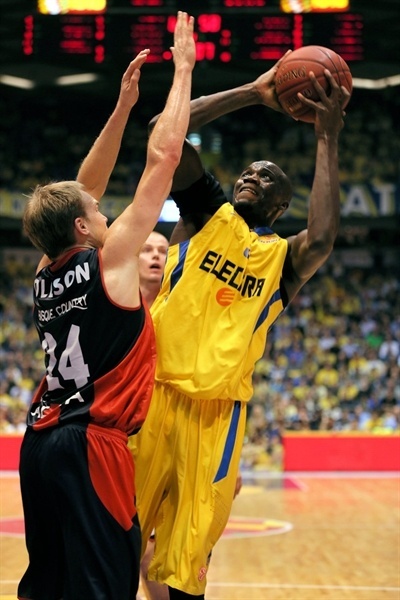 Maccabi had a final chance to win the game, but Oyahon missed on the game's final possession. 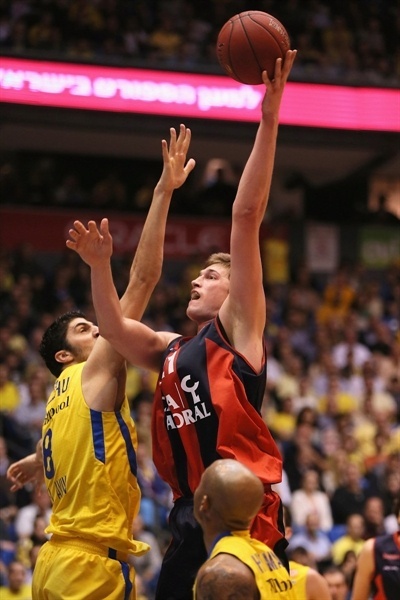 Thomas Heurtel got Vitoria going with a three-pointer and Milko Bjelica added a second-chance basket for a 0-5 lead. Hickman slashed for a big basket - and the free throw that came with it – and Smith erased Maciej Lampe's running hook with a driving layup. Hickman kept pacing Maccabi with a bomb from downtown that gave Maccabi its first lead, 8-7. Milko Bjelica shined with a fast break layup, which Smith erased with his trademark jumper off the dribble. Brad Oleson joined the three-point shootout and a jump hook by Milko Bjelica gave Vitoria a 10-14 edge. 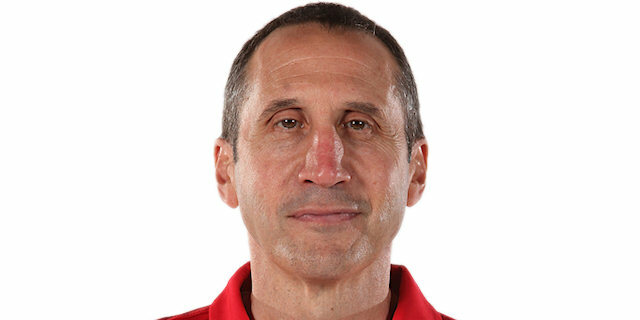 Planinic split free throws and erased Fernando San Emeterio's circus shot with a put-back layup for a 13-16 Maccabi deficit. Milko Bjelica took over with a dunk, but David Logan bettered that with a three-pointer. 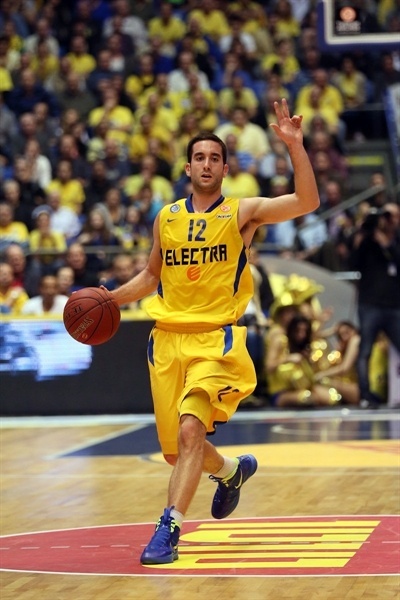 Heurtel nailed a baseline jumper, but Planinic single-handedly put Maccabi back ahead, 21-20. A buzzer-beating jumper by Landesberg capped a 7-0 run and fixed the score at 23-20 after 10 minutes. Nemanja Bjelica buried a three-pointer early in the second quarter, but a wild five-meter jumper by Yogev Oyahon put Maccabi back ahead, 25-23. Landesberg shined with a power layup as Vitoria struggled to find open shots… until Omar Cook fed Fabien Causeur for a fast break layup. Causeur returned the favor, finding Cook for a mid-range jumper and a free throw by Andres Nocioni gave Vitoria the lead, 27-28. James dunked, but Nemanja Bjelica answered with a tip-in and soon fired in a three-pointer for a 29-33 Vitoria edge. Nocioni shocked the crowd with a three-point play full of energy that capped a 2-13 run. James split free throws, but Nocioni extended the margin. Maccabi kept struggling to score and a three-pointer by Cook caused Coach David Blatt to call timeout at 30-41. Lior Eliyahu banked in a close shot, which Causeur bettered with a three-pointer to give Vitoria a 12-point margin, 32-44, at halftime. Both teams struggled to score after the break until Tibor Pleiss stepped up with an alley-oop slam. 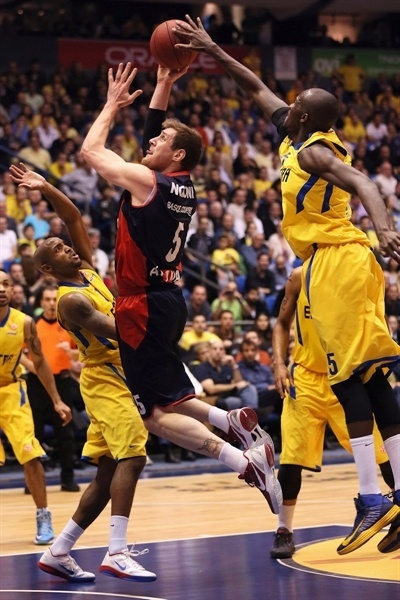 Planinic dunked at the other end and free throws by Smith gave Maccabi some hope at 36-46. Planinic split foul shots, but San Emeterio nailed a three-pointer that gave the guests some fresh air at 37-49. Ohayon tried to change things with a close basket, but Vitoria kept controlling the game, using long possessions to find open shots. Hickman made free throws and added a fast break slam, as Vitoria had to adjust its defensive strategy once it entered the foul penalty. Coach Zan Tabak called timeout and Cook returned to the floor to improve the guests' ball circulation. Landesberg closed the gap with a corner triple and Smith buried a mid-range jumper to make it a 1-point game, 48-49. Oleson split free throws, but Hickman followed a driving layup with a three-pointer that completed the hosts' comeback, 53-50. Landesberg buried another triple at the buzzer to bring the run to 17-1 and ignite the crowd, 56-50, at the end of the third quarter. Fourth quarter: Down to the last shot! Smith shined with a finger roll layup which capped a 19-1 Maccabi run that bridged the final two quarters. Vitoria tried to play more aggressive, forcing Maccabi to pick up 4 quick fouls, get in the penalty and change its game plan. Nemanja Bjelica buried a seven-meter bomb and Lampe also nailed one from beyond the arc to make it a two-point game with over six minutes to go. 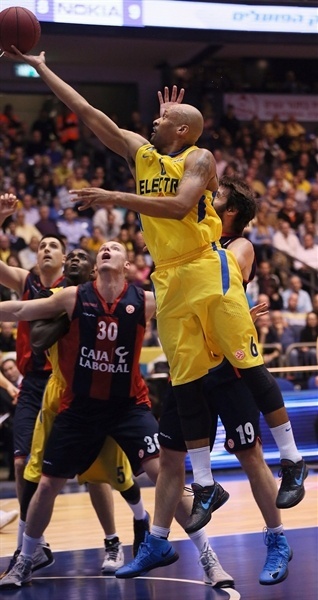 Maccabi could not find the way to the basket and Nocioni brought Vitoria a bit closer, 58-57. Oleson capped a 0-10 run with a catch-and-shoot corner triple, good for a 58-60 Vitoria edge. James stepped up with a three-point play and free throws by Hickman restored a 63-60 Maccabi edge with over three minutes to go. Eliyahu scored in the low post and James added a layup, but Nemanja Bjelica bettered that with back-to-back triples and Oleson buried another one from the very same spot before Maccabi called timeout at 67-69. Hickman split free throws and a block by James allowed Oyahon to shine with an up-and-under layup for a 70-69 Maccabi edge with 29.6 seconds to go. San Emeterio came through with a big driving basket. Maccabi called timeout with 8.9 seconds left to set up the final possession. It all came down to the last shot, but Oyahon could not score in the game's final possession and Vitoria celebrated a big road win. "Congratulations to Vitoria. I really felt and thought after the first half that we were going to win. The problems from the first half were clear to me. We spoke about what to fix and I think we did that, but we missed three times at the end of the game and they made three critical three-pointers. Still, we had a shot to win it, but we missed on the final play. It’s tough to lose a game like this that was in our hands, but you have to know not to lose it and to focus on getting back on track. Of course I’m concerned. It’s never easy to lose and certainly not at home. It’s a tough loss, but we need to look forward and we will need to win at least one more game on the road, because we’re certainly at a disadvantage now. Every play is important and the fact that we did such a poor job rebounding defensively in the first half made a difference in the end." "I knew that it would be a tough game. In the end my players had the mental toughness to fight back from a deficit and I congratulate them for this. We continue to worry about each game and don’t focus on the standings." 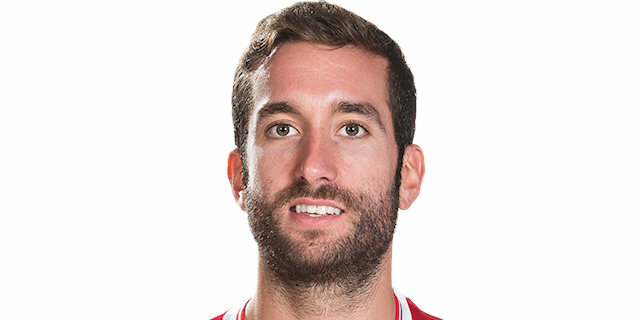 "I made a move and it didn’t go in. I am very disappointed in myself. Obviosuly this was a very important game for the rest of our season. We were in position to win. We came back in the game and could have won. Like I said, one play and we lost. Maccabi doesn’t lack anything; we are a good team. The thing that will bring us out of this is a victory. As soon as the first win comes, things will get better. The best medicine is a win."